What’s happening to Finland’s economy? 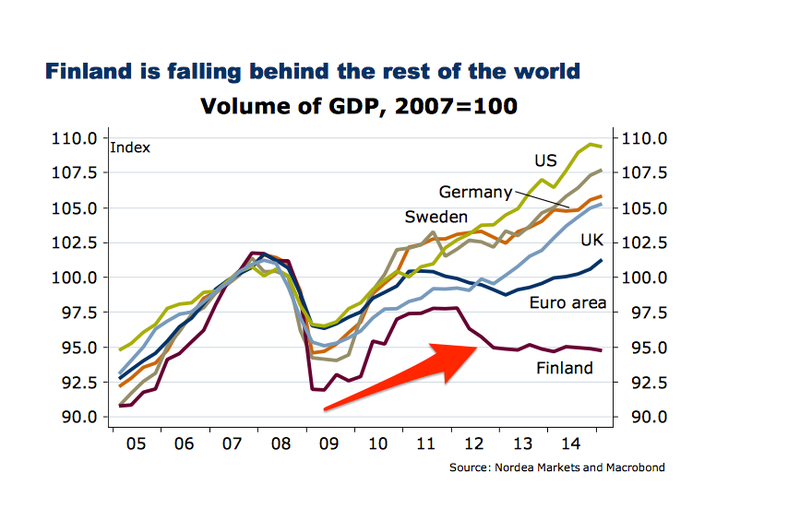 Finland’s economy has had a torrid time since the onset of the financial crisis and the euro crisis that followed it. Indeed, 2015 looks set to be the fourth consecutive year that the economy has either contracted or stagnated, even as the recovery in the rest of the euro area (excluding Greece) seems to be picking up pace. A part of this story has been the failure of exports to increase as much as expected. One factor that helps explain this is the decline of one of the country’s major exporting companies: Nokia. In 2000, the company accounted for some 4% of Finland’s GDP, but its fortunes reversed dramatically following the introduction of the Apple iPhone and Android devices into the market. By 2013 it accounted for less than 0.5% of the country’s output. However, the problems are not confined to a single company or industry. 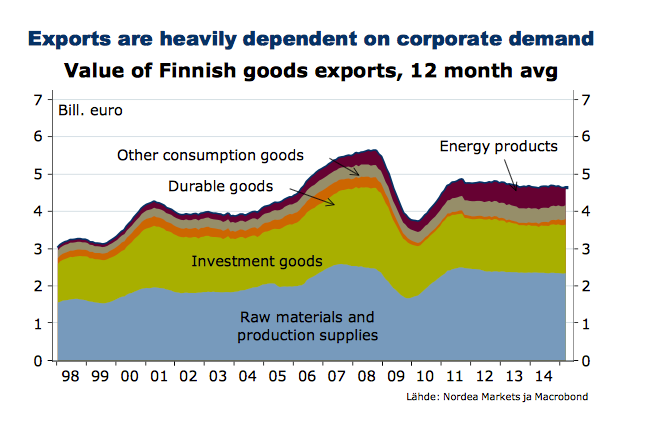 The deeper problems are in the composition of Finland’s export market. Almost half of the country’s exports are raw materials and production supplies used in manufacturing and a further third are investment goods. Despite the broad uptick in growth across the Eurozone, neither manufacturing nor the pace of corporate investment are growing at a sufficient pace to boost Finnish trade prospects. This is having spillover effects on domestic company expansion plans, with private-sector investment at its lowest point for 15 years, according to Nordea Bank. So are there any grounds for optimism? In the short term, it looks like it’s going to be a difficult period for Finnish workers. On 22 July, Finnish Prime Minister Juha Sipila announced plans to cut the country’s wage costs by 5% by 2019. In other words, there are going to be significant pay cuts. Currently Finland has the seventh-highest labour costs in the Eurozone, joint with Germany. 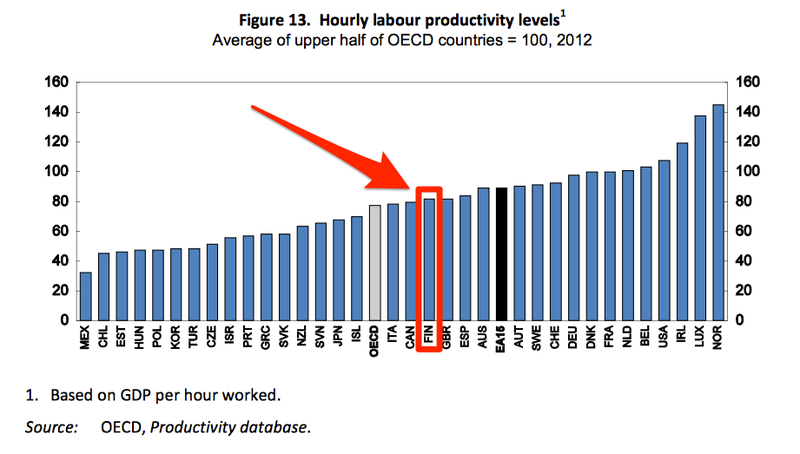 However, its labour productivity (GDP per hour worked) is significantly below the Eurozone average. As a consequence of this, unit labour costs are some 20% higher in Finland than they are in Germany. Without a free-floating currency to help boost competitiveness with its fellow euro member states through devaluation, the adjustment has to be carried out through internal devaluation (lower wages and/or higher unemployment). The signs of this can already be seen with unemployment at 9.4% and likely to stay above 9% through 2016. One way of achieving this adjustment without significantly increasing job losses or forcing people to accept nominal pay cuts is to increase the amount of hours worked without raising wages accordingly. Yet there will have to be some difficult negotiations with the country’s unions if they are to achieve this. The hope is that the painful adjustment will allow Finland to benefit, once corporate investment starts picking up across the Eurozone, as survey data has been suggesting it will, and the manufacturing sector begins to increase activity. Why has investment in the Eurozone been so weak? Author: Tomas Hirst is editorial director and co-founder of Pieria magazine and was previously commissioning editor, digital content at the World Economic Forum. His work has been featured in the Times, the Guardian, Prospect Magazine, the Financial Times and Quartz.